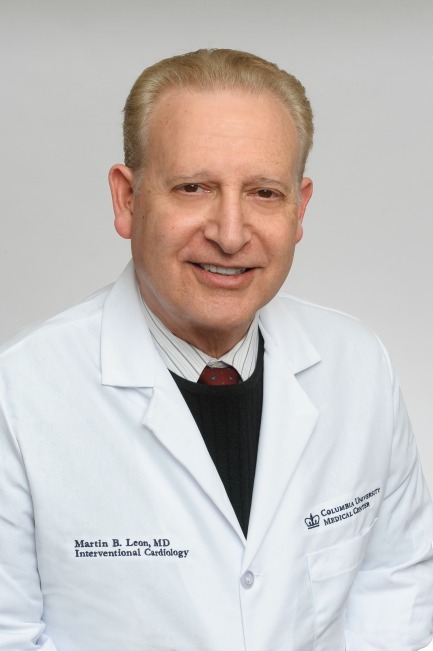 Martin B. Leon, MD is Professor of Medicine at Columbia University Medical Center (CUMC). Dr. Leon is also Director of the Center for Interventional Vascular Therapy (CIVT), Director of the Cardiac Catheterization Laboratories, and on the Executive Board of the Columbia NewYork-Presbyterian Heart Valve Center. He continues as a practicing Interventional cardiologist at NewYork-Presbyterian Hospital in New York City. Dr. Leon is also the Founder and Chairman Emeritus of the Cardiovascular Research Foundation. Dr. Leon has served as principal investigator for over 50 clinical trials that have helped shape the field of interventional cardiovascular medicine, including the following studies: STRESS, STARS, Gamma-one, SIRIUS, ENDEAVOR, and most recently, the PARTNER trial, studying the value of transcatheter valve therapy for patients with aortic stenosis. Dr. Leon has co-authored over 1550 publications, has performed over 10,000 interventional procedures, and has had a major impact as a thought-leader and innovator in the expanding sub-specialty of interventional cardiovascular device and drug therapies. He is the Director and Founder of Transcatheter Cardiovascular Therapeutics (TCT), the world’s premier interventional cardiovascular meeting, which recently celebrated its 24th anniversary. Dr. Leon has also served as Director or Co-Director of more than 100 international educational programs in areas of interventional cardiology. Dr. Leon has received 10 international career achievement awards and was awarded an honorary degree from the University of Athens. Dr. Leon was previously the Director of Cardiovascular Research and Education at the Lenox Hill Heart and Vascular Institute in New York. Prior to that, he was Director of Clinical Research at the Washington Cardiology Center at the Washington Hospital Center and Clinical Professor of Medicine at Georgetown University Medical Center in Washington, DC. Earlier in his career, he served as a Clinical Associate, Senior Investigator, and Director of the Catheterization Laboratories in the Cardiology Branch of the National Heart, Lung and Blood Institute at the National Institutes of Health in Bethesda, MD. He was a founder of the Washington Cardiology Center and the Cardiology Research Foundation in Washington, DC. Dr. Leon completed a fellowship in Cardiology at the Yale-New Haven Hospital. He completed medical school at the Yale School of Medicine, and his internship and residency in internal medicine at the Yale-New Haven Hospital.